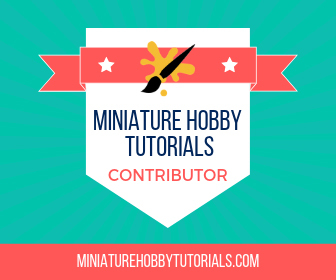 Brush Wizard: Project Announcement: Pinned Down, Taking Fire! - Building the Wall, and then Exploding it. Project Announcement: Pinned Down, Taking Fire! - Building the Wall, and then Exploding it. It's time to start a new project and that project is something I've been looking forward to for a while now. 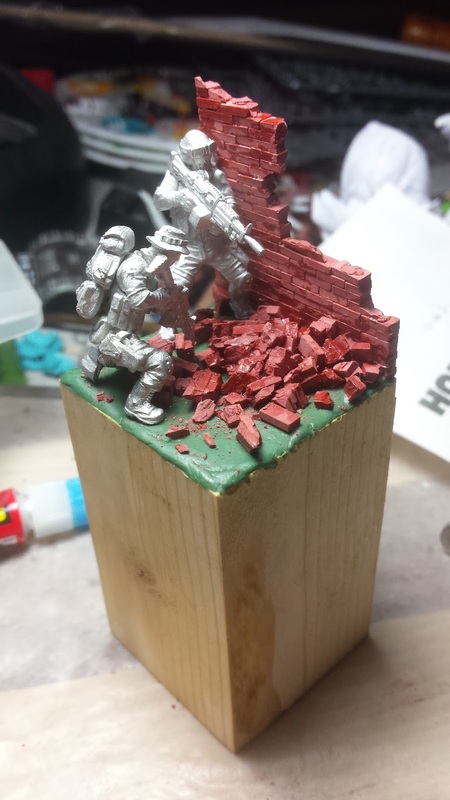 This new project is titled "Pinned Down, Taking Fire!" and it's a departure from my usual fantasy based pieces, instead being modern military. I've been wanting to play with modeling bricks for awhile now and could never find them locally. But thanks to @paintsandstuff on Twitter, I was able to find an online store that had them. Of course, they weren't from a US retailer and I ended up waiting a while for them to show up. 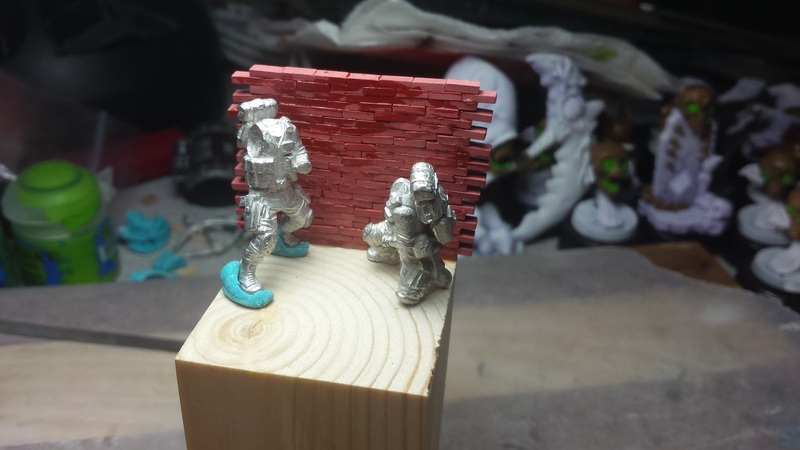 soldiers from Hasslefree Minis in the UK. Both of these guys are super cool and as soon as I saw them I knew I needed to use them for something. Much like the bricks they were imported from outside the US and required a bit of a shipping wait. Totally worth it though. a corner? How tall was it and how tall do I need it? Did I buy enough bricks? 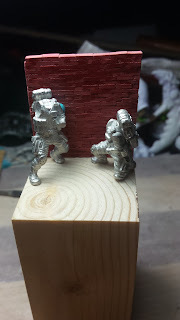 Finally I decided on a straight wall that was a few rows taller than the standing soldier. Building the was took close to an hour, I think. I'm not quite positive on the actual time, because I was in the zone and listening to music.I had to be careful how I assembled it, because I wanted as straight a wall as possible. I ended up using tweezers and super glue to assemble it. 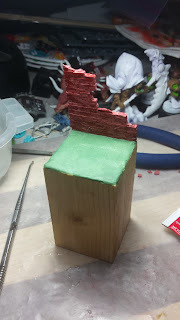 Once the wall was all assembled, I used a straight edge to mark the overhanging bricks and slowly cut through them with my x-acto knife's blade. It was a slow process and once I was about halfway through they started breaking off. So, I needed to scrape the high spots down. With the wall built, it was time to destroy it. I knew that if i tried breaking it by hand it wouldn't look right. And if I built it to look broken it wouldn't look right. 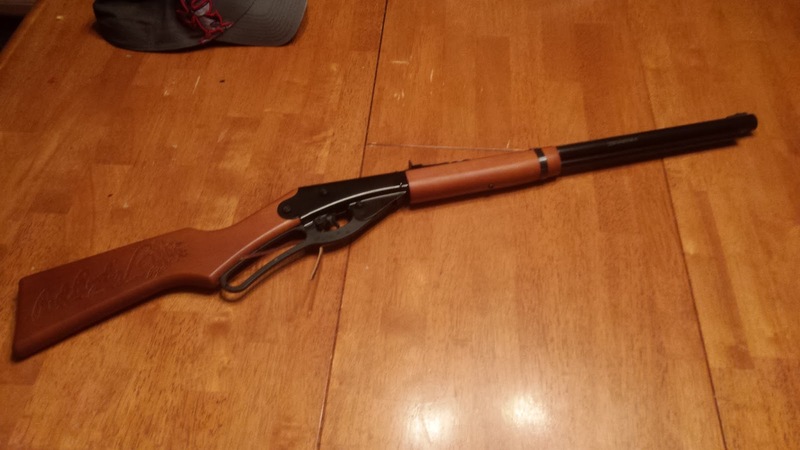 So the plan from the word go was to shoot it with a bb gun. This would blow the bricks apart and give the breakage a better, more realistic break. It worked well too! I did have a minor issue with it, where it blew the upper most section off, but I glued it back into place easily. I made sure to grab and scrap pieces from the breakage, so I could use them as pieces of rubble on the ground. Then I went to work with the green stuff to cover the floor. 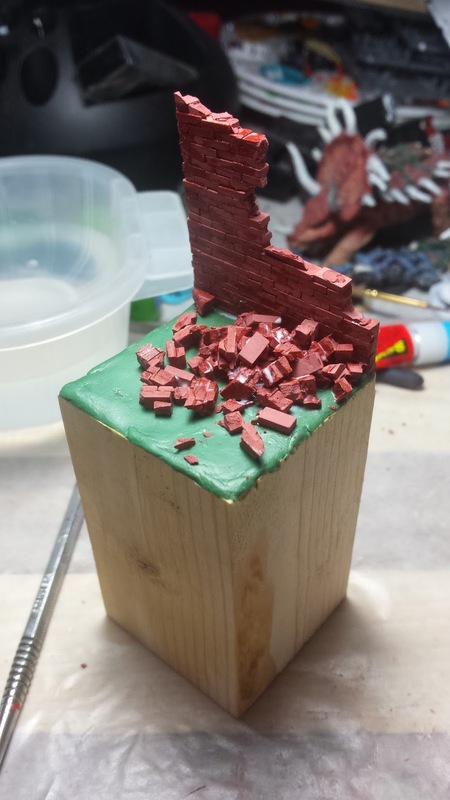 Once the green stuff was dry, I began gluing rubble down. 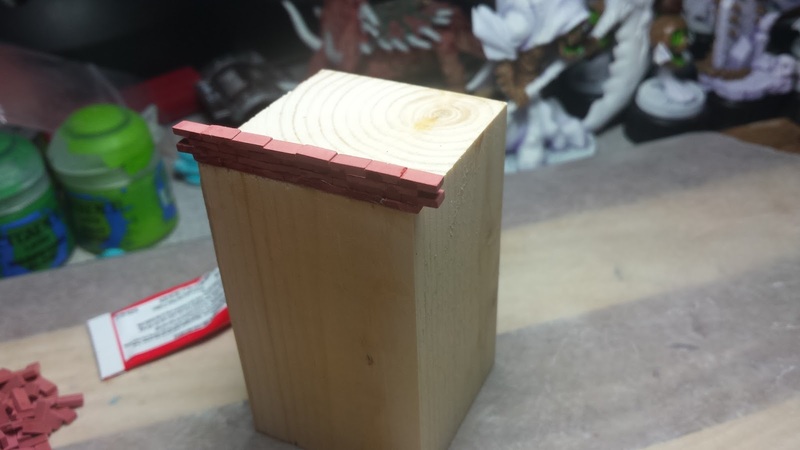 I used Elmer's glue for this step and covered the entire base with it. It was then sprinkled with rubble pieces. This process took a while, because I needed to wait for the glue to set before I could put more glue on and more rubble on top. But in the end the extra wait time was worth it and it turned out nice. I even took some left over solid bricks and added them in to help with the effect. Due to the way the wall broke, I had to move Woody (the crouching soldier) to a different position. Rather than having both soldiers hiding directly behind the wall, they are no both hiding to the left of the opening. This set up seems more believable to me, since I doubt he would be trying to crouch behind that little amount of wall structure. That's it for now. But you can follow the progress of this project on Twitter as well. I am already deep into the painting phase, you can expect another WIP post within a few days.